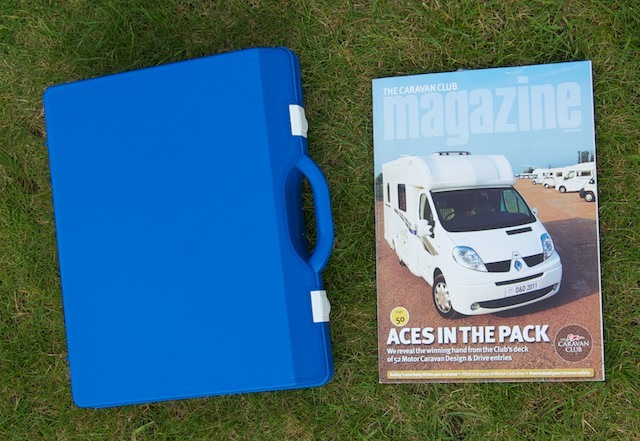 The Safari is a versatile unit which will find many uses aside from providing showers for people - for instance, dealing with muddy dogs, boots, mats and motorhomes. 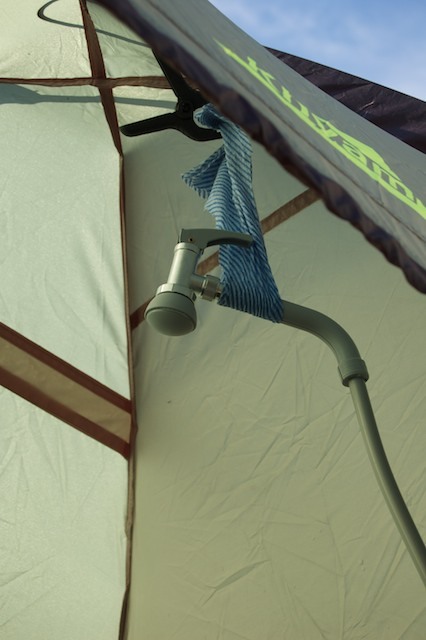 The shower is endowed with no less than 4 metres of hose and 6 metres of power cord for the 12v connection, making it easy to plug in and to deploy. The amazing thing is that the Safari still packs down into a tiny - but sturdy - plastic case which is more or less the size of an A4 sheet of paper, although somewhat thicker at 70 mm. 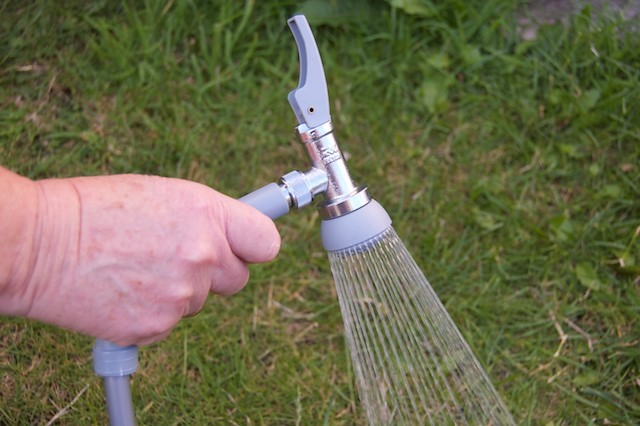 The submersible pump is placed in a suitable water container - for showering simply add a kettleful of hot water to a greater quantity of cold water; then plug the power cord into a 12v supply. The unit is fitted with a universal type plug which fits into a cigar lighter socket or into the DIN type of socket which is commonly found in the habitation areas of motorhomes. 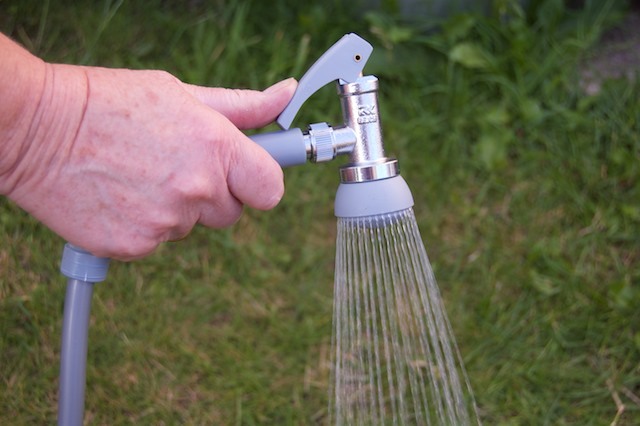 Once the pump is running the flow of water is controlled from the shower head; the vented pump can be left running even when water is not being drawn off and this offers the advantage that the water in the hose is kept under pressure so that water emerges from the shower head instantly whenever the lever is pressed on the shower head. The substantial metal shower head has a lever which can be set in the off position; or allow flow as long as the lever is held down; or the lever can be locked in the on position to allow hands-free continuous operation. While the pump is running it consumes only around 1.5 amps (18 watts) so even a ten-minute shower would take merely about 0.25 Ah from your leisure battery. 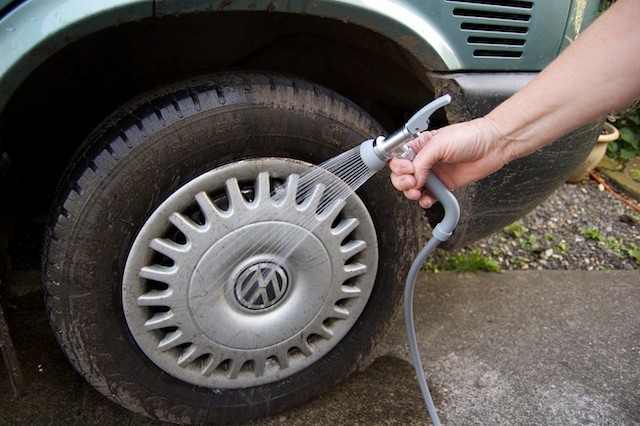 In fact Reich states that when the pump is kept running simply to maintain pressure its power consumption is reduced. So far this is purely on the basis of a test back at base - not yet out 'in the field'. For this test I took a shower - in the garden, but otherwise as realistic as possible. 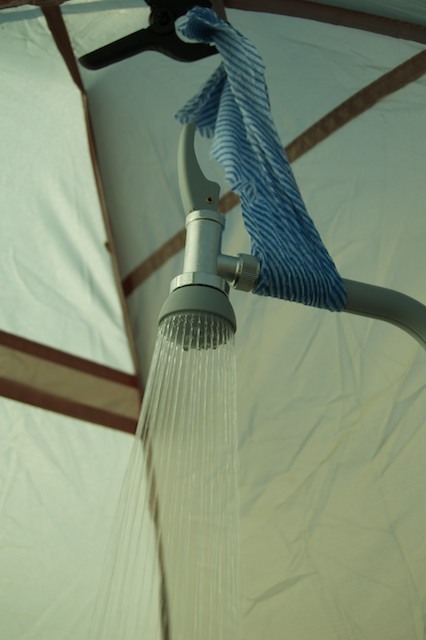 The shower 'block' was a quick-erect Khyam shower tent, wherein I placed soap and shampoo. Water was laid on in a half-full 10 litre plastic jerrycan - so yes, 5 litres, to which I added a litre of boiling water, giving me a total of 6 litres. At this point please understand that this was a big challenge for me as my regular shower behaviour is very liberal with much soaping and rinsing and much water. In a normal indoor shower, twenty minutes would be quick for me. Look, I also do a lot of thinking in the shower. 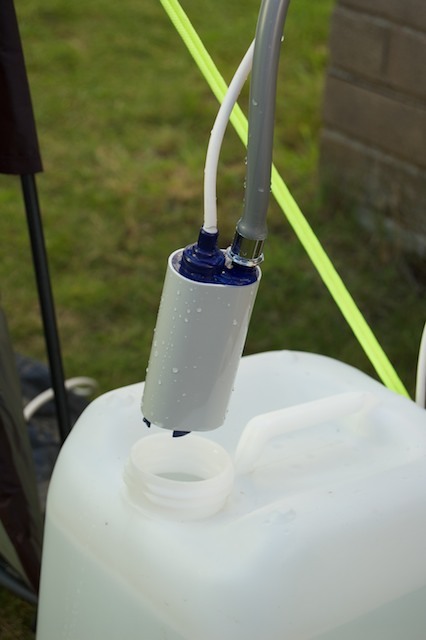 On this occasion my thinking was that the Safari shower pump (0.9 bar) delivers at a generous rate even with its very long hose length (in my tests at around 2.7 litres a minute when the shower is at head height) so I was focused on a water-efficient procedure. 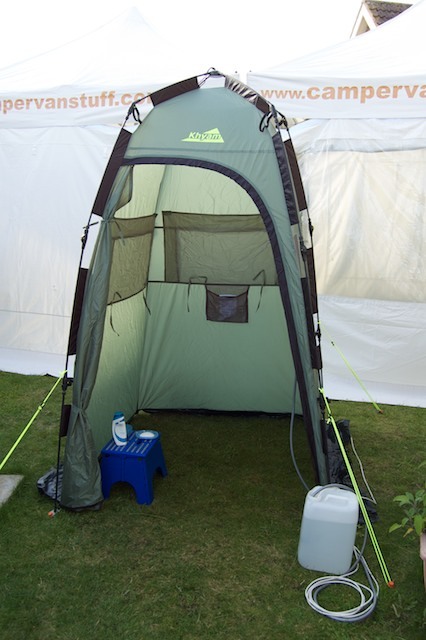 After plugging in the power cord I entered the shower and removed my gown (yeah, I know, but the garden is overlooked) and placed it outside the tent. The shower head was suspended in a makeshift arrangement (a piece of cloth folded into a sort of sling) above my head and then came the first test - temperature. This test was passed happily: it was a mild day and the temperature of the water at 1:5 ratio was mildly warm. Obviously, different ratios can be used to balance weather conditions, personal preferences and water heating considerations. Now the trigger action of the lever was perfect for wetting my hair, which I then shampooed without further use of water until I was ready to rinse; for this I adopted the continuous mode which allowed me to use both hands to work the soap out of my hair. Quick as possible, mind you. 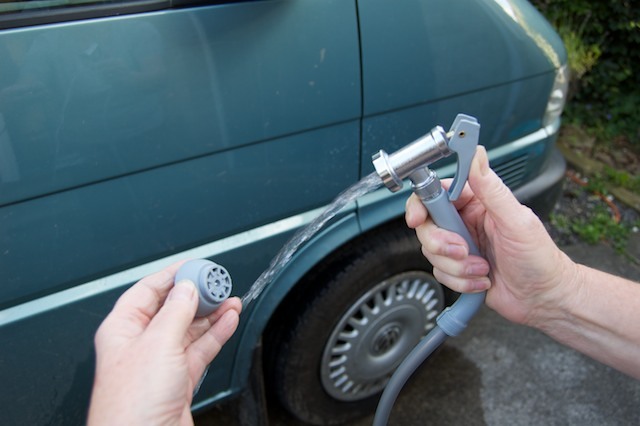 Then a quick all-over spray before the whole-body soaping business, during which, again, no further water was required so I could be thorough without wasting water. Then a complete rinse-down, with the shower producing a strong spray which was more than adequate for the job. I finished just as the pump began to gurgle. This exposed a weakness in my logistical planning because I should have located the jerrycan just outside the tent door where I could keep an eye on the water level since the pump should not be allowed to run dry for a great length of time. 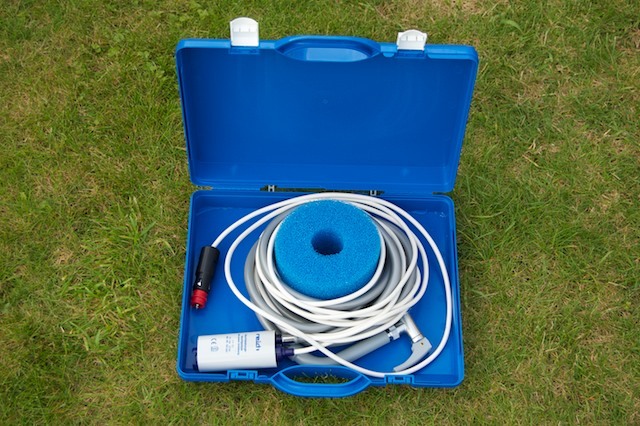 Result: the Reich Safari portable shower provided an easy, satisfying and effective shower. 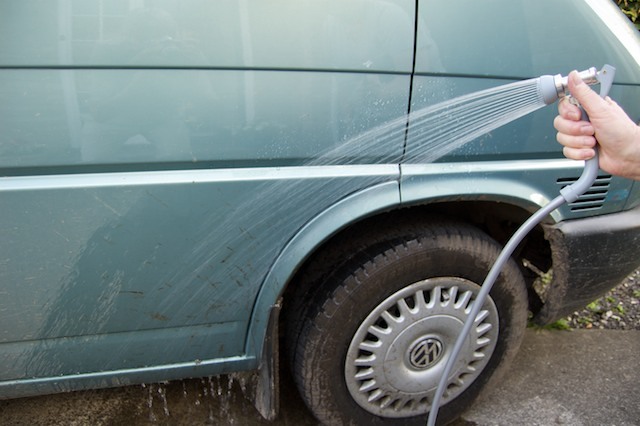 I have no doubt that for us it can solve the showering issue (our high-top campervan does not have an on-board shower) when we are pitched for longer stays at a location without facilities - or with unattractive facilities.